PORTLAND, Ore.—Widmer Brothers Brewing today announced the arrival of Hefe in cans. Hefe has been the brewery’s flagship beer for 30 years, and the Original American Hefeweizen is still the best-selling craft beer in Oregon. To celebrate Hefe’s 30th anniversary this year, the storied, award-winning beer will be available in 12-ounce cans in six- and 12-packs for the first time ever in the Oregon market exclusively. Kurt and Rob Widmer, co-founders of Widmer Brothers Brewing, first brewed their improvised version of Hefeweizen in 1986. Initially, beer drinkers didn’t know what to think of the cloudy beer served with a lemon slice, but it didn’t take long for the distinctive beer to catch on in Portland and eventually elevate Widmer Brothers Brewing to national acclaim. Widmer Brothers is also credited with creating a new beer style with Hefe: American-Style Wheat. Widmer Brothers is launching Hefe in bright yellow cans in the Oregon market to give fans of Oregon’s Favorite Craft Beer even more opportunities to enjoy their favorite beer starting this summer. The new cans will allow Oregonians to enjoy Hefe while appreciating the endless number of outdoor activities and natural beauty of the Pacific Northwest. Hefe is making its first public appearance in cans this Sunday, March 13, 2016, at the Shamrock Run, the famed Portland running season kick-off event that Widmer Brothers has sponsored for 16 years. 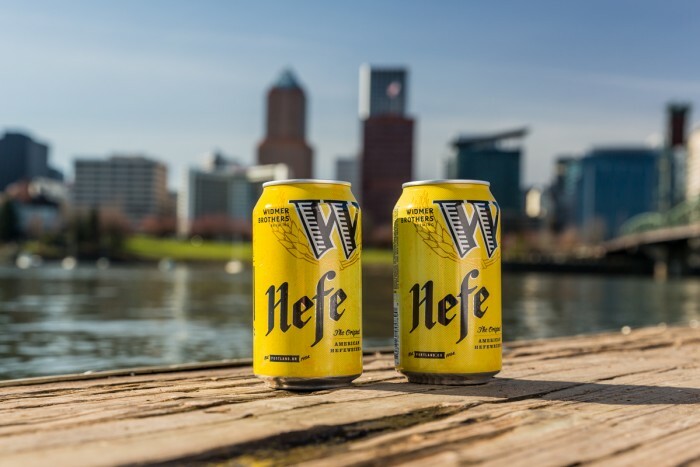 Hefe cans will be available to finishers of the race who are 21 years of age or older free of charge on a first-come, first-served basis, and for purchase at the finishing area at Tom McCall Waterfront Park. Additionally, Providence Park, home of the Portland Timbers, will start selling cans of Hefe at the next home Timbers game vs Real Salt Lake on March 19, 2016. Hefe was named the “Official Craft Beer of the Portland Timbers” in 2015 and will continue to have a strong presence in and around Providence Park. For more information on Widmer Brothers Brewing, visit widmerbrothers.com or see what the brewery is up to on Facebook, Twitter, and Instagram. Widmer Brothers Hefe (pronounced: “Hay-fa”) began as an improvisation inspired by brothers Kurt and Rob’s love of German style beers. Brewed with golden wheat, Hefe’s unique cloudy appearance, bold flavors, and citrus notes defined the American-style Hefeweizen. Multiple awards and three decades later, Hefe remains the gold standard and Oregon’s favorite craft beer. Prost, to the Original! World Beer Cup gold award winner in 2004, 2008 and 2014. Great American Beer Festival gold medal winner in 1998 and 2006, and silver medal winner in 2014. Oregon Beer Awards gold medal winner in 2015. Widmer Brothers Brewing helped create the Pacific Northwest craft beer movement in 1984 when founders Kurt and Rob Widmer, then in their 20s, began brewing unique interpretations of traditional German beer styles. In 1986, Widmer Brothers Brewing introduced the original American-style Hefeweizen, which elevated the brewery to national acclaim. Since then, the brewery’s iconic Hefe, which celebrates its 30th anniversary in 2016, has grown to become Oregon’s favorite craft beer. For more than three decades, Widmer Brothers has continued to push the boundaries of craft beer, developing a variety of beers with an unapologetic, uncompromised commitment to innovation. Based in Portland, Oregon, the brewery currently brews a variety of beers including Hefeweizen, Upheaval IPA, Steel Bridge Porter, Drop Top Amber Ale, Replay IPA, and a full seasonal lineup. Additionally, the brewery continues to make a series of limited edition, small-batch beers available in Oregon and at the Widmer Brothers pub in North Portland.